Splendidly morbid and claustrophobic western with a great cast. I have mixed feelings about this one. It's definitely not Tarantino's best, but I don't think it's his wort either. The concept is great, 8 "strangers" are stranded in Minnie's Haberdasher during a blizzard and fireworks ensue. But, the movie felt a little long and I felt the the actors weren't giving it their all, they seemed a little flat. One nice thing about the film, the great Ennio Moricone's soundtrack. 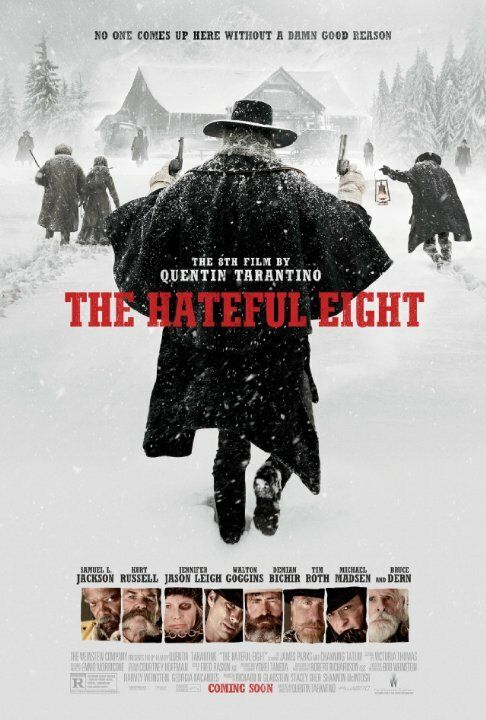 For fans of Tarantino, like myself, this is a must see, but, it's just ok when compared to his other films. I would say go see this, but don't expect it to be as good as Django. A bounty hunter transporting a murderer shelters from a blizzard in a remote way station, but begins to suspect that some of his fellow travellers are not who they claim to be. I read that one of the major influences for Tarantino for The Hateful Eight was John Carpenter's claustrophobic, paranoid horror classic, The Thing. It makes a lot of sense in that if you turned that film into a western and got rid of the alien (but kept all the mistrust and paranoia) you would wind up with this film. You even get Kurt Russell to star and Ennio Morricone (who worked on The Thing) to score the film. It all works out in the end and I am happy that a little breach didn't shelve this movie for good. No posts have been made on this movie yet. Be the first to start talking about The Hateful Eight!